Fitbit and many other activity tracking wearables monitor your sleep patterns. For a data dive into your deep sleep, however, you'll need a dedicated sleep-tracking device like ResMed's S+, as well as the associated Android and iOS apps. Do you snore in your sleep? (Maybe that's a better question for your better half. Or maybe not.) How much REM sleep do you get each night? That's where ResMed's S+ Android and iOS apps, and its S+ sleep sensor device come in. S+ is a $150 gadget that sits on your bedside table. It monitors your movements and breathing, as well as your sleeping environment's temperature, light and noise. It then assigns you a "sleep score" based on this information, with 100 being perfect and 0 meaning you should be on The Walking Dead. Unlike a Fitbit (which tracks sleep as well as exercise), S+ tracks your sleep at night without an additional device you need to wear, and it gathers much more specific sleep data. To start or stop recording your sleep, you use ResMed's S+ apps, which were recently updated on Android and iOS. As you initiate the tracking process, the S+ app asks you a few questions about your day, such as how many caffeinated and alcoholic drinks you consumed and how stressed you were. You can also use the app to record any last-minute thoughts, including a to-do item, to get it off your mind before you rest. A "Smart Alarm" feature awakens you during "the right phase of sleep" that's closest to your designated alarm time. I started testing the S+ system on Dec. 2. Initially, I had to use a bit of trial and error ito find the right device placement so it could read my breathing patterns. It's ideal to have the monitor within arm's reach and pointed toward (and above) your chest. Sometimes, however, I hug a pillow in the middle of the night, which may have interfered with S+'s ability to read my breathing on those nights. You can sleep with your back to the device or under an electric blanket, however, and still get a "read." You need to start and stop sleep sessions using the mobile app, so the temptation is strong to keep your smartphone or tablet in your bedroom at night. I did this a few times and regretted it. On one occasion, I forgot to set my iPhone's "Do Not Disturb" mode. During the night, half a dozen text messages arrived from East Coast family members. The vibrating notifications didn't help my sleep at all. After a few nights of this, I tried starting and stopping my sleep tracker using a smartphone located in another room. On one occasion, this caused my Samsung Galaxy Note smartphone to lose its Bluetooth connection to the S+ device, and no sleep data was recorded that night. Otherwise, I found that keeping the smartphone out of the bedroom works well. Regardless of where you use your mobile device, it's generally considered poor "sleep hygiene" to look at a smartphone or tablet screen before bed. A better option might be Siri-like voice interaction to start and stop S+ sleep monitoring. A company spokesperson told me "ResMed is looking at auto-start and other forms of tracking for future versions to enhance the customer user experience." As for the data S+ gathered, on most nights, I received a good score for REM sleep, which ResMed says is important for refreshing your mind, and a nearly perfect score for body sleep. 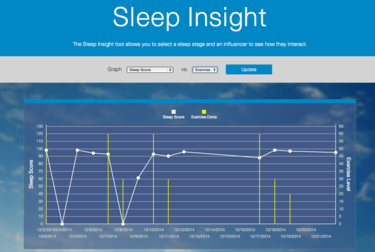 Though the mobile apps give you access to graphs of your sleep history, you'll find more analytic tools on the S+ website. For instance, you can compare your sleep score against how much you exercised, to see if your physical activities boosted your sleep score. In my case, sometimes they did, sometimes not. It would really be helpful to see all the factors you tell S+ about your day — stress, caffeine, alcohol and exercise — compared against each day's sleep score in one graph. As of this writing, this isn’t available. "ResMed processes S+ data to customize and tailor feedback to individual users about their personal sleep patterns. ResMed does not sell Personally Identifiable Information or any other personal data, including the sleep data from the S+ devices. ResMed does de-identify sleep data in accordance with privacy standards set forth in federal law, including HIPAA and HITECH, and uses aggregate anonymized data to understand sleep trends and patterns and to help improve the products we provide to patients. ResMed uses stringent technical and organizational controls to meet or exceed global privacy requirements, including those in EU 95/46/EC and US government standards for security and privacy." Do you need a $150 sleep-tracking gadget that takes up space on your bedside table? I say yes, if you have ongoing sleep issues and could benefit from understanding how your daily activities, such as exercise and caffeine consumption, affect the quality of your sleep. Otherwise, just follow common sense. Don't drink caffeinated beverages after noon. Only consume one or two alcoholic drinks per day and none within two hours of sleep. Don't look at your smartphone or tablet two hours before bed. Get plenty of heart-pumping exercise during the day. And if all else fails, move into a monastery.